I really don’t know anyone who doesn’t like the original Transformers TV show, and not matter if you are a fan of the Transformers movies, you will probably like the cool Transformers Monopoly board game. 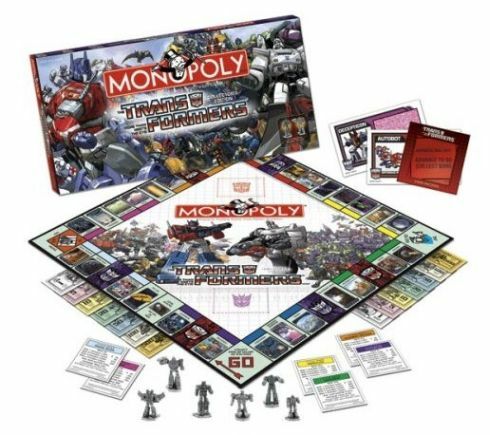 The classic game of Monopoly is making another comeback with different styles and designs, and with this newest Transformers version, the Autobots and Deceopticons will play for real estate and earth in a more civilized way with Properties, Autobots and Decepticons cards and even Energon cubes. The various Transformers characters that are granted as the pewter tokens are: Optimus Prime, Megatron, Bumblebee, Soundwave, Jazz, and Starscream. The tokens may not transform and change looks, but the character will still stand proud on the Monopoly board. The new Transformers Monoply will not break your bank, with an affordable and decent price tag of $24.95 and simply grant Transformers fans a way to learn about the world of trade, real estate and money in a whole new way that may not be real innovative but is still fun.